Students with the Innovation Center Tech Team would like to invite you to bring in your Apple equipment (Mac, iPad, iPhone, Apple Watch, Apple TV) for software and how-to questions. They also do hardware repairs on personally-owned Macs. The Innovation Center, located at 1200 S. Sunset Street, is open Tuesday – Friday, 3pm-5pm. Students also can answer questions via text chat at 707.832.4783 (S0S.Tech.Que). 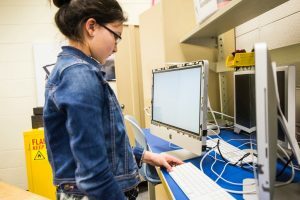 The Innovation Center Tech Team is a program that provides SVVSD students an opportunity to complete Apple Certified Technician Training. This year 21 students (10 young men and 11 young women) passed the certification course and now work at the Innovation Center after school. Over the past four years, approximately 100 students have acquired this valuable certification in SVVSD. On a recent visit, two young women were working at the service desk. When asked, they said the best part of the work was the real-world experience and opportunity to help customers. They are learning new skills about asking the right questions, addressing customer needs, completing work in a timely manner, and communicating with customers about progress made. Student workers are able to respond to questions via text chat or in person. What a great SVVSD program that develops relevant skills and provides students a competitive edge!